Prominent & Leading Manufacturer from Pune, we offer ersa vario 4 soldering system and ersa i-con1 soldering station. 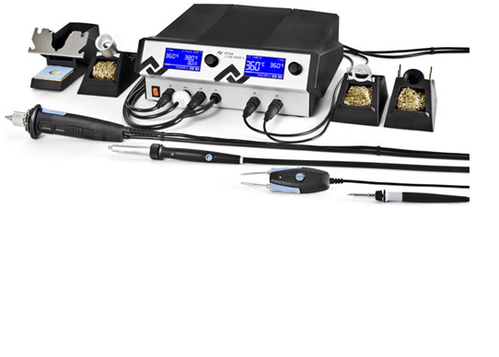 The i-CON VARIO 4 multi-channel soldering and de-soldering station offers to the professional user two simultaneously usable soldering tools. 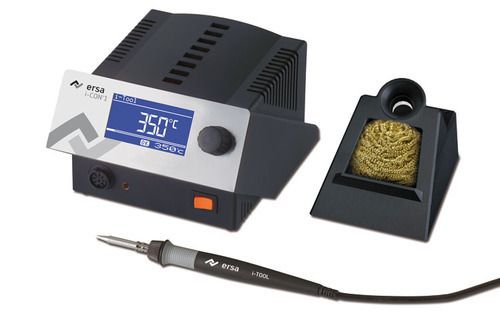 In parallel to the new, ergonomically designed hot air soldering unit i-Tool AIR S (200 W) is it possible for three other soldering tool such as the 150 W i-Tool, the ideal tool for classical soldering applications, or the newly developed de-soldering tweezers Chip Tool Vario (80 W) or the x-Tool for de-soldering. With a microSD memory card, the station can be quickly and safely configured, so that it is optimally prepared for all applications in professional electronic manufacturing. The station is well suited for the use in ESD protected zones. We are offering ERSA I-CON1 Soldering Station to our clients. Looking for “ERSA Soldering Stations”?